(b) 3 layer, 10cm x 10cm each sheet, 200 sheets per roll. These are the standard size toilet papers. They're very popular, easy to find and are available in many different brands. There will be a slight variance in size from brand to brand but will usually fall within the guidelines listed above. 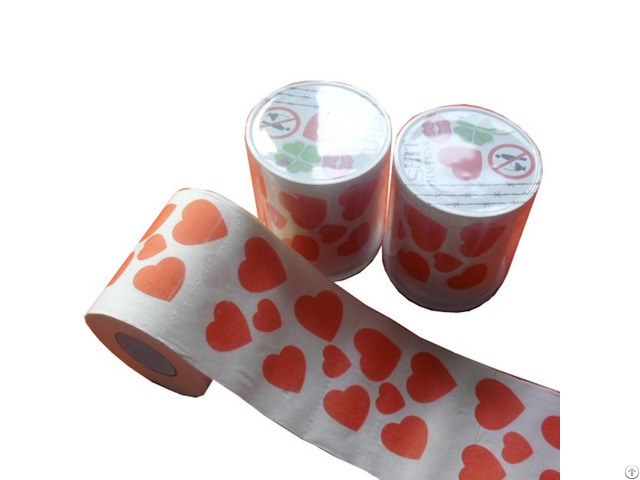 Main products include custom printed toilet paper, paper napkins, disposable paper tablecloth, gift wrapping paper, flushable paper toilet seat cover. After years of development and expansion, In order to satisfy the different requirement of the clients to the printed toilet paper, we imported many advanced tissue production equipment, such as the 6c flexography printing machine.In order to ensure all products reach the international requirements, such as SGS or FDA. All printing and dyeing are finished with the pure natural environmental water-based ink and pigment. And all products must have high-temperature sterilization and disinfects process. we use the high dustless workshop for finished products packaging to block the spread of germs. we have professional design team，quality management system and sales service department, Not only providing professional product development and design, But also offering the most assured quality and excellent service.